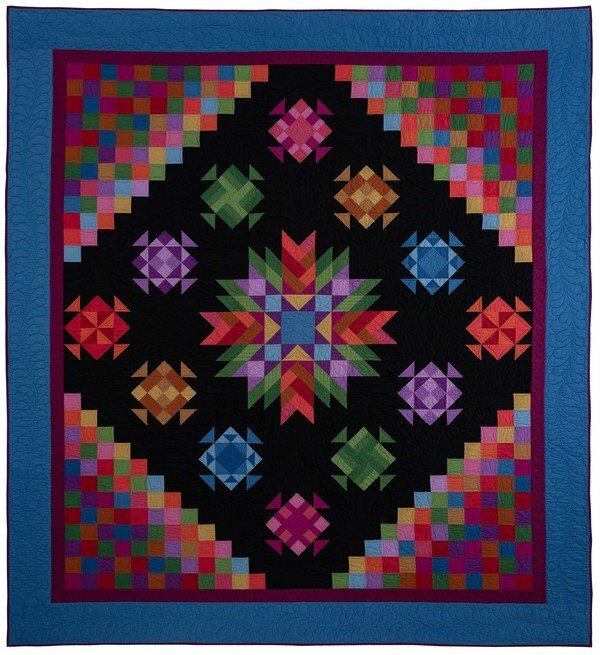 Nancy Rink's newest Amish inspired block of the month design, merges elements of a traditional Amish Trip Around th World with a unique center star and a variety of colorful blocks all set against a black background, Nancy's careful color placement gives each block a beautiful floating dimensional twist. Eight New Colors were added to the Centennial Solids collection by Marcus Brothers specifically for this block of the month. Now, with Amish IV, Nancy shares her favorite methods for merging color, piecing shades of a color to create depth and visual excitement. This is a 12 month Block of the Month starting January 2019. This block of the month includes all of the fabrics for the top, binding and pattern. all at once $ 191.40 and this will be FREE SHIPPING.